Hola. Compré hace poco en eBay un tablero Mephisto Modular sin piezas. Pensaba que de los varios juegos de piezas magnéticas que tengo por casa, alguno valdría... pero no! Son demasiado débiles para activar los sensores reed. Si alguien tuviera las piezas originales o compatibles con este tablero, le agradecería que se pusiera en contacto conmigo. Gracias. It works perfectly - but pieces are a bit small (they best fit 25x25mm squares). Carnelian II pieces also work fine, but they are too small as well. Thank you a lot, Tibono! I received today the SouvNear chess set from India (the one I bought on Amazon in August). Thus five weeks for delivery. - some figures are not the same size, check c2-d3-e4 pawns - d3 is bigger. Same issue with both black knights and black rooks (heights differ). In addition to size, shaping is obviously not the same comparing black rooks. - under the figures a poor thin green paper disk is glued, instead of usual smooth felt. As a result, moving the figures provide an uncomfortable rough contact with the board and as magnets are powerful, some tend to slip and stick together. This can be enhanced easily with convenient felt disk stickers. Thus I would recommend to pay more for a better quality product (and faster delivery), such as the 58€ one from "la boutique des échecs". 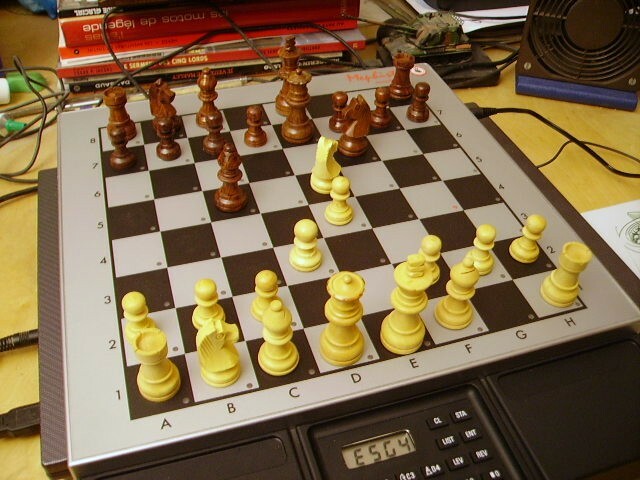 tibono escribió: - some figures are not the same size, check c2-d3-e4 pawns - d3 is bigger. Same issue with both black knights and black rooks (heights differ). In addition to size, shaping is obviously not the same comparing black rooks. T'es pièces ressemble beaucoup à des pièces Novag. Jai mis en vente un mephisto exclusive pour 250 euros en très bel état avec un module miragenre. Je peux descendre le prix si il t'intéresse. The 30 cms pieces of "la boutique des échecs" seems nice. Maybe -if I don't find them in Spain- I will bought that set. Thank you again for the info. A few days for delivery, the set fits modular board size (to my humble opinion) and quality is correct - close to nice. White pieces color is not as yellow as my snapshot shows - just electric light effect. No size nor shaping issue, it is really a set - not an addition of pieces. Magnets are a bit too strong but pieces being heavier than previous set and felted, they do not tend to gather and stick - just a small push of a few millimeters occurs sometimes. Another side effect is: sometimes biggest pieces (queen & king, I assume their magnets are larger) may unexpectedly keep activated a border square reed switch; I mean the switch is mostly activated by a piece on it and nearby queen adds a distant contribution - moving the piece elsewhere should release the switch but it stays on due to the nearby queen. Moving the queen up and down releases both switchs (it's own and the newly freed square's one) then only the queen's one goes back to activated status. No distant activation of switches for empty squares occurs. Game is fully playable and I am satisfied with the look and quality. In addition, I expect magnets to loose a small quantity of power while aging. Perhaps you can reduce this effect by adding a thicker felt to the base of the pieces. Basically because you increase the distance between the magnet and the board.